It all started with a chair. It’s true! When our golden tufted wingback armchair Hearst was added to the VL collection, a delightful idea popped into my head. I'm a history buff, so Hearst got his namesake from gold mine baron George Hearst, owner and proprietor of the Homestake Mining Co. in Lead, South Dakota. From 1877 to 2002, Homestake was one of the largest gold mining businesses in North America and left an undeniable legacy in our little corner of the world. 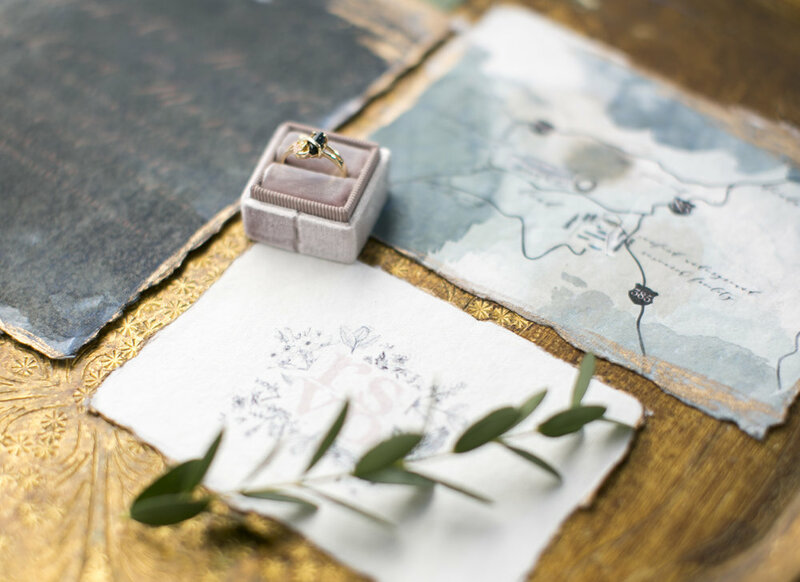 So when I was dreaming up The VL’s first styled shoot, I knew I had to showcase our history rich region as a place for a modern elopement style wedding. And what could be richer than a gold mine? Thus the theme for this styled shoot became Homestake, History Meets Modern. Everything about this shoot has a historical flavor with a modern twist, even the location itself. A rich mining history with modern scientific advancements, the small town of Lead was a perfect fit. I stumbled upon the Sanford Lab Homestake Visitor Center when I was "tour guiding" for my parents who were visiting from Maine. A museum of both history and science, the Visitor Center tells the story of the Homestake Mining Company and the modern science behind the experiments taking place 4,850 ft below the surface. And when I saw the circular piece of the Davis experiment (if you don't know what I'm talking about then you need to take a trip to the Visitor Center) with the expansive Open Cut as its background, my heart said, now this would be an epic place to get married. 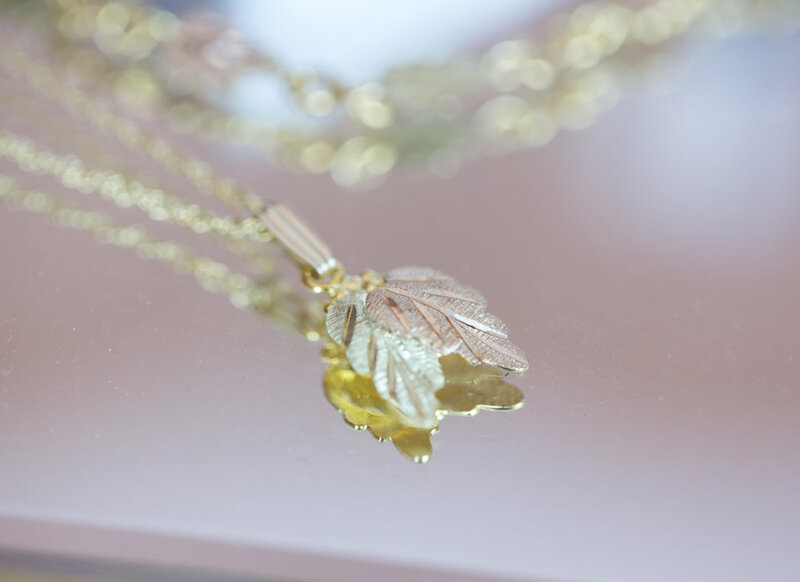 The color palette was inspired by Black Hills Gold jewelry--black, blush, gold, and leafy greens. 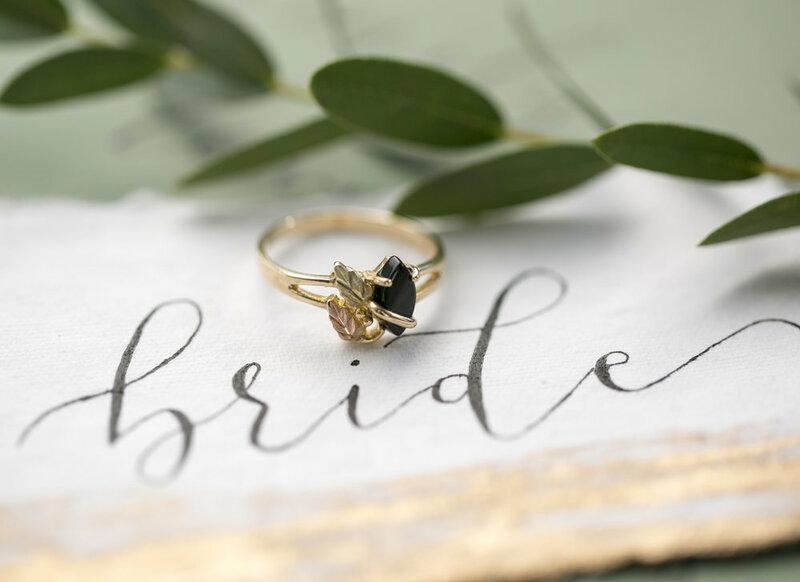 I wanted to inspire beyond the typical bridal accessories and chose a black onyx ring, black tear drop earrings, and a delicate leaf patterned necklace and bracelet set. The groom modeled a classic Black Hills Gold band and a simple black leather strapped watch. The invitation suite created by Emily Costopoulos Photography & Design was totally on pointe. Moody black watercolor invites on hand torn paper, brushed with gold leaf, set the tone for the invitation suite. Beautiful script, blush pink RSVP cards, and a hand drawn map put this suite in a collection entirely out of this world. It felt old, yet edgy. The VL mismatch wooden chair collection provided seating, and the ceremony scene took place in front of the impressive 20 ft mine shaft with the raw and rugged Open Cut looming in the background. Greenery encircled oil lanterns and vintage rugs decorated the aisle, drawing the eye to octagonal gold pedestals bearing gorgeous floral arrangements provided by Victoria's Garden. The florals complimented the theme perfectly with hues of blush, neutrals, and pops of dark color, framed in greenery and pampas grass. The bride and groom's apparel was selected to highlight the history meets modern theme. I chose a simple and chic Madison James gown from Love Struck Bridal Boutique with clean lines and plenty of romance. Stylists from AJ's Wicked Salon + Spa gave the bride a natural eye palette with bold lips and a romantic side-swept hairstyle that completed that old meets new look. For her bouquet, a loose asymmetrical floral arrangement was carried in an heirloom bride's basket for a truly unique look. The groom's apparel was classic casual with sandstone brown pants, a white button down, and suspenders. He looked like he could have walked straight out of the 1880 Homestake Mining Co.
Outside on the concrete patio overlooking the Open Cut, our heirloom sweetheart table was draped in flowy blush chiffon, the bride's basket florals, and brass candlesticks. Black taper candles and velvet napkins added a pop of dark color to an otherwise light and romantic tablescape. Vintage gold flatware, china from our extensive collection, and layered goblets took this look to the next level. Calligraphy on rocks from the Open Cut and a menu for two designed by Emily Costopoulos Photography & Design gave a personalized and intimate feeling to this sweetheart tablescape. The tiered cake from Bakehouse exceeded expectations and brought the old and modern theme to life. The bottom tier was modern with its marbled grey black fondant and gold leaf details. In contrast, the top tier, a naked cake with hints of gold, perfected reflected its natural surroundings. Sitting on top of a vintage gold rimmed cake stand, the cake was topped with real floral and surrounded by gold dusted chocolate macaroons in cut glass dessert dishes. A champagne station on our gold Venetian side table, complete with a vintage ice bucket and champagne flutes, stood ready to toast the happy couple. Inside the Visitor Center, first looks were exchanged before the couple moved on to a comfy lounge area, perfectly curated to provide an intimate setting for the bride and groom to read their vows. As the sun began to set, the bride threw on a blush suede jacket and booties from Altar Ego Fashions and we hiked a hillside for some epic light shots and one last dance. I am always amazed by the skills of Cadey Reisner Weddings and these perfectly dreamy, sun streaming shots are classic examples of her work. I can not find words to completely express my gratitude towards the vendors who shared their talents to make this styled shoot come alive. I am truly thankful. As I approached each vendor with my vision for the shoot and ideas for what I wanted things to look and feel like, each took my vision and added their personal touch and expertise. They are all wonderful people and would make an excellent choice for your special day, always going above and beyond in everything they do!